This rare statuary, a memorial to loved ones, was conceived by Col. Henry Wooldridge. His central marble figure was carved in Italy. He was devoted to the memory of his family and his life. Animal lover, famous fox hunter and member of the Masonic order, only he is entombed here. Details are available at the Chamber of Commerce. Our Graves County Genealogical Society is making a book of people from Graves County that have served in the armed forces. If you know of anyone that has served or is presently serving, and they are from Graves County, we would appreciate their name, rank, and period of service. 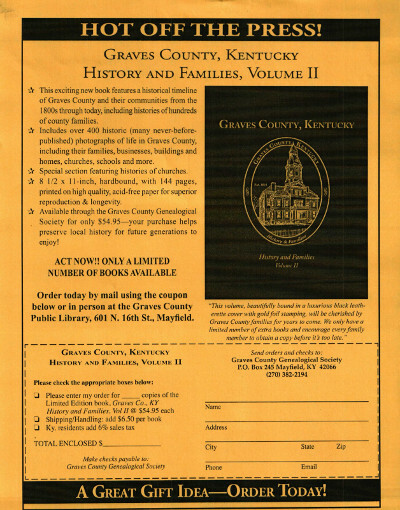 The book will be kept in the Graves County Public Library for use by those seeking information on their ancestors or descendants.